The photovoltaic (PV) power system harnesses energy from the sun to generate electricity. This system . . . The system shown above is isolated from any sources of outside electricity. For this reason, it is known as an "off-grid" system. This is the type of system in the 2005 Maryland home. However, a home does not need to be powered exclusively by solar energy to take advantage of its benefits. Two options are available to homeowners who live in an area where utility grid electricity is available. These systems are known as "grid-tie" or "utility-interactive." The first, lower-cost option forgoes the use of batteries completely and feeds electricty from the PV panels to the inverter, eliminating the need for a charge controller. When the PV panels generate more electricity than is needed by the home, the excess electricity is fed back into the utility grid. 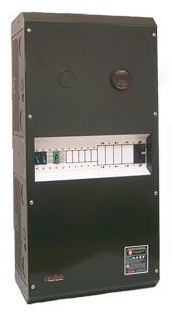 This surplus power is bought back by the local power company, and is usually credited on the homeowner's electric bill. At night, or other times when the home needs more electricity than the PV panels can provide, normal grid electricity is used. The inverter controls the use of PV and grid electricity seamlessly. 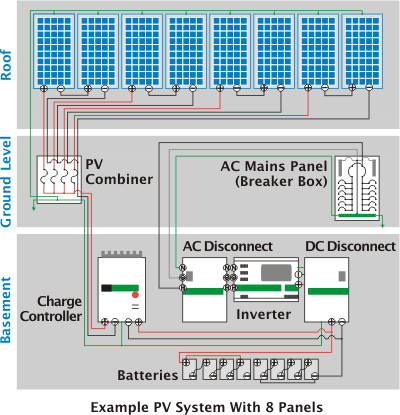 The second option is to have a PV system with batteries and a charge controller, essentially an off-grid system, but provide a connection to the utility grid as well. If the PV panels and batteries cannot generate and store enough electricity for the home, grid electricity is used. The advantage to grid-tie systems is that homeowners can take advantage of the use of solar energy, lower their electric bills, and still have reliable grid electricity - all simultaneously. Many localities provide monetary incentives to homeowners who wish to install PV systems. Often, the local or state government will pay for a significant portion of the up-front system cost and provide tax credits for the use of PV systems. A comprehensive list of state incentives can be found on the Database of State Incentives for Renewable Energy (DSIRE). In addition, BP Solar has a Solar Savings Estimator that will calculate the cost of a typical installed system, taking into account some incentives available in your area. Maryland's house uses 51 BP Solar 4175 panels, each generating 175 watts of electricity. Doing a little math on a sunny day, our array is capable of generating 8,925 watts of electricity. The 2005 Maryland house uses 3 OutBack Power Systems PSPV PV combiners. 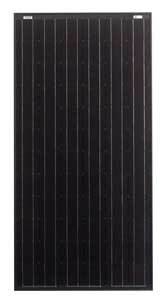 Each PSPV can handle 12 PV panels. A typical car battery is rated for 12 volts, and usually holds 40 amp-hours of electricity. Maryland's home features 32 East Penn Deka 8L16 batteries, each rated to hold 370 amp-hours at 6 volts. 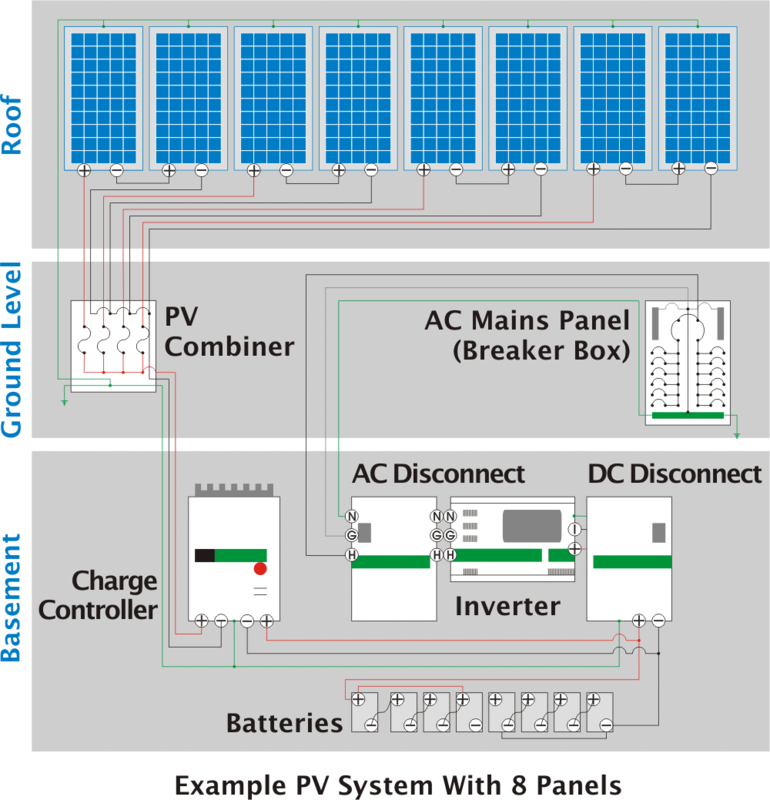 For safety, homes with PV power systems are required to have a main disconnect that separates the PV system from the rest of the home's electrical system. 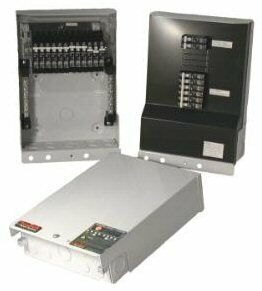 The 2005 Maryland house will feature an OutBack Power Systems PSDC DC disconnect. The inverter takes in DC electricity and makes it into AC electricity. The 2005 Maryland home will feature 4 OutBack Power FX3648 Sinewave Inverters. 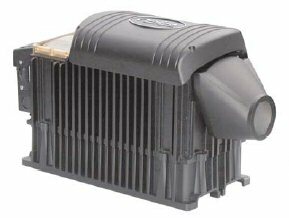 Each inverter takes in 48 volts DC, outputs 120 volts AC at 30 amps continuously, and can handle 3600 watts continuously. The AC Disconnect is where the AC electricity created by the inverters travels into the house. When the home moves to Red Wiggler Community Farm, it will have a connection to the electrical grid.